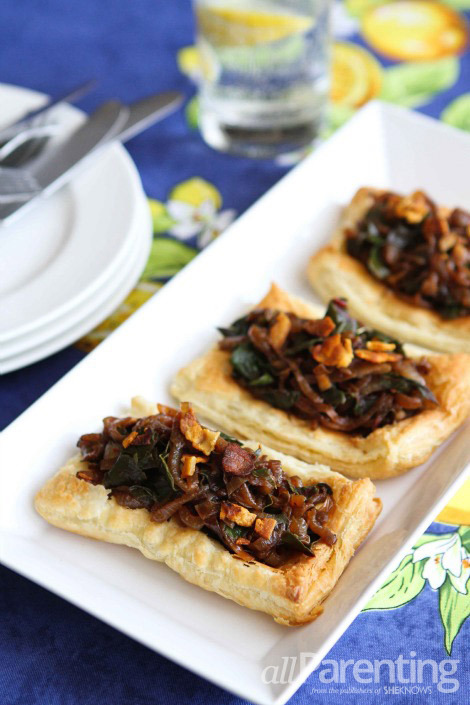 The deep, rich flavor of caramelized onions and salty pancetta make a positively addictive topping for this easy puff pastry tart, while Swiss chard adds a pop of color. Whether you're looking for a light dinner or an appetizer for your next dinner party, these individual puff pastry tarts will do the trick. They may look fancy, but prepared puff pastry found in the supermarket freezer section takes out the extra work of rolling out pie or pizza dough. The deep, rich flavors of caramelized onions and salty pancetta make a positively addictive topping for these tarts, while wilted Swiss chard, rich with vitamins, adds a pop of color. Be sure to plan ahead, as the sheet of puff pastry will need to be defrosted. Simply wrap the folded, frozen sheet in plastic wrap and set it in the fridge or on the counter to defrost. When it is partly defrosted, unfold the pastry, lay it flat and re-wrap it to fully defrost. Skipping this step may result in pastry that sticks together and is difficult to unfold. Preheat the oven to 450 degrees F and lightly coat a baking sheet with cooking spray. Heat a large saucepan over medium-high heat and add the chopped pancetta. Cook until golden brown. 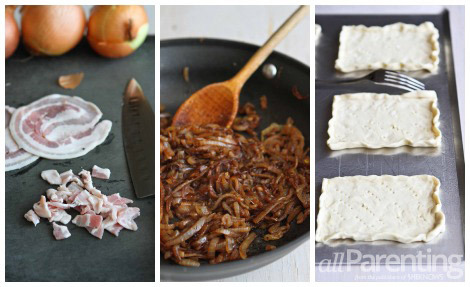 Remove the pancetta with a slotted spoon and drain on a paper towel. Reduce the heat to medium. Discard all but 2 teaspoons of the pancetta fat. Add the olive oil to the pan with the pancetta fat. 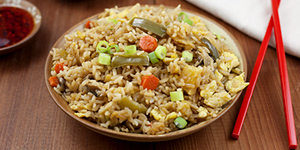 Add the onions and cook until softened and light golden brown, stirring occasionally, about 15 minutes. Add the water and the dried thyme, cover the pan and cook until the onions are golden brown, about 15 minutes. Add the balsamic vinegar, salt and pepper, and cook for an additional 30 seconds. Rinse the chopped chard in water, then add the wet chard to the onion mixture. Cover the pan and cook until the chard is wilted, 3 to 4 minutes. While the onions are cooking, prepare the puff pastry. Unfold the sheet of puff pastry and cut along the fold lines to form 3 long, narrow strips of pastry. Cut each strip in half crosswise to form a total of 6 rectangles. Place the rectangles on the baking sheet. Pinch the edges of each one to make the edges higher than the center of the pastry. Prick the pastry all over with a fork. Bake until the puff pastry is golden brown, about 12 minutes. Remove from the oven and immediately press down the middle of each rectangle to form an indentation for the onion mixture. Divide the onion and chard mixture between the 6 tarts. Sprinkle with the pancetta. Serve.